Thus, only certain wave-lengths will reinforce each other (resonate). 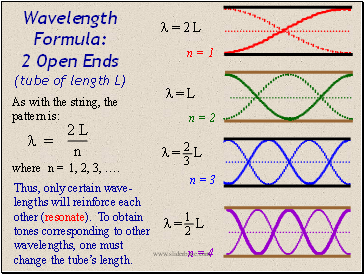 To obtain tones corresponding to other wavelengths, one must change the tube’s length. where n = 1, 2, 3, …. 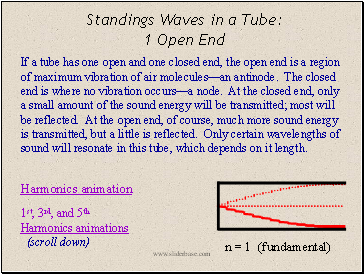 If a tube has one open and one closed end, the open end is a region of maximum vibration of air molecules—an antinode. The closed end is where no vibration occurs—a node. At the closed end, only a small amount of the sound energy will be transmitted; most will be reflected. At the open end, of course, much more sound energy is transmitted, but a little is reflected. Only certain wavelengths of sound will resonate in this tube, which depends on it length. 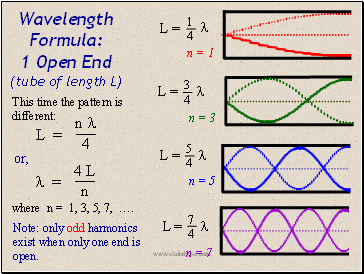 Note: only odd harmonics exist when only one end is open. where n = 1, 3, 5, 7, …. Touch a vibrating tuning fork to the surface of some water, and you’ll see the splashing. The more frequently the tines vibrate, the higher the frequency of the sound. The harmonics pics would look just like those for a tube with one open end. 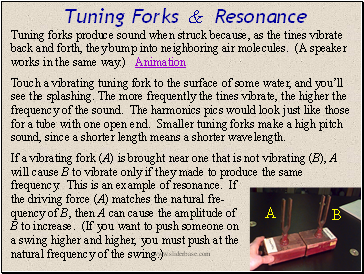 Smaller tuning forks make a high pitch sound, since a shorter length means a shorter wavelength. determined by flicking the glass with your finger and listening to the tone it makes. 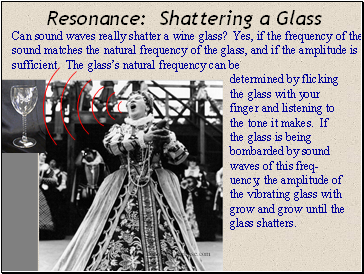 If the glass is being bombarded by sound waves of this freq-uency, the amplitude of the vibrating glass with grow and grow until the glass shatters.